Smokers tell us that setting a quit date feels good. It's a first step in taking back control of the smokes. It also gives you time to get organised. Setting a quit date gives you time to prepare. It gives you a chance to chuck out the cigarettes and ashtrays, dust off your walking shoes, and make sure ‘Eye of the Tiger’ is at the top of your playlist. It also helps you get your head around quitting, and it feels good to take charge of your quit attempt. 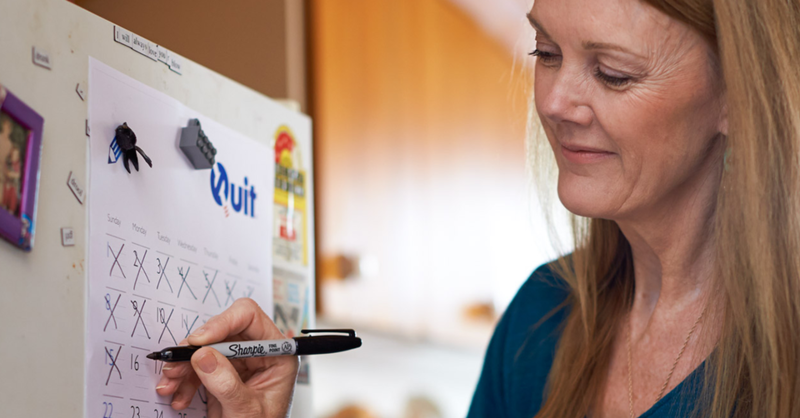 If you’re planning to use quitting medication such as Champix (varenicline) or Zyban (bupropion) or a nicotine replacement therapy (NRT) product, you’ll need to set a quit date depending on what product you’re using. Quitting on the spot works for some people – I you're feeling it, go for it! – but setting a quit date can be really useful. Pick a date in the next two weeks. Give yourself time to prep, but don’t leave it too long so that you lose motivation. Choose a day to stop smoking when you’ll be busy, but not under too much pressure. Get rid of cigarettes the night before. If you have cigarettes in the house, you’re always a minute away from a smoke. Cravings come and go so a few minutes can make all the difference. If you live with a smoker, talk to them about your quit day and quitting. How would you like to be supported? Plan for your quit day so you’re ready to go when you wake up e.g. have your new breakfast routine sorted and the car full of petrol. Quit date set, let’s prepare! If you’ve decided to quit or have set a quit date, well done! Now it’s time to prepare and increase your chances of quitting for good. Make your house and car smokefree. Experiment by not smoking at times when you normally would e.g. the pub, smoking breaks at work, or with your morning coffee. Try a new time-out routine. Try a smokefree day (some people end up just quitting at the end of a smokefree day). Separate smoking from pleasant activities like sipping warm drinks, sitting down, TV, socialising. Decide to refuse all offers of cigarettes from others. Consider picking up a new hobby or revive an old one. Exercise is a great way to fight a craving. Talk to your partner, or friends and family. How would you like to be supported? Are you an ask-me-how-I’m-going type person or the don’t-mention-it type? If you live with a smoker, chat to them about keeping the house smoke free, or at least keeping their smoking to one place. Do a quit shop: think healthy snacks – carrots and celery sticks, seeds and nuts, a new drink bottle. See your GP – if you take medication, this may need to be adjusted before you quit. Your GP may also be able to help you with quitting products. Set up a Quitline call or request a Quitline callback. Quitting is a bit like learning to ride a bike. Most people don’t succeed on their first try. Some people relapse up to 30 times before quitting for good. Quitting takes time, so try to be patient and never give up giving up. 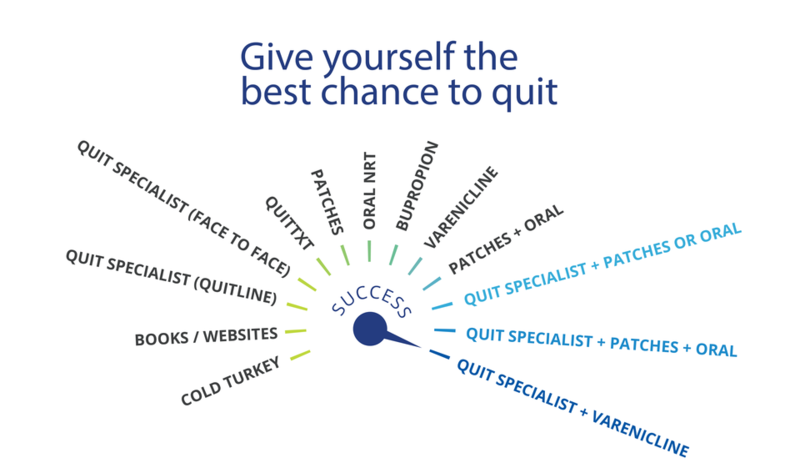 Our Quit Specialists can help you develop tactics to resist cravings and increase your chances of quitting for good. They can even organise to call you on your quit date, and in the early weeks of quitting. Give them a call on 13 7848. Or request a Quitline callback. The most effective way to quit smoking is to use Quitline plus either NRT (patches, gum, lozenge, mouth spray, inhalator) or quitting medication (Champix/varenicline, Zyban/buprobion). If you use NRT, we recommend combination therapy: patches plus a fast-acting NRT product like mouth spray or gum. Are you quitting smoking for the first time, or having another crack at it? Here are some tips to help you quit for good! Are you ready to call yourself a non-smoker? So you've been quit for a few weeks and you've gone through the hard yards. Last step: embrace the non-smoker in you! The best way to be organised in life is to make a list. Make a list of what you need in preparation to quit. You'll be ready for cravings, triggers and stress.